"brand name" producer (Screen Gems). Within five years, Hanna-Barbera had become a brand name in its own right, to the point where it was possible to sell a show on the basis of that name alone. The New Hanna-Barbera Cartoon Series began in syndication on September 3, 1962, with three segments, none of which had ever been seen before: Touché Turtle, Wally Gator, and Lippy the Lion & Hardy Har Har. An early version of Hardy had been seen a couple of years previously, as a guest star in the "Snooper & Blabber" segment of Quick Draw McGraw. 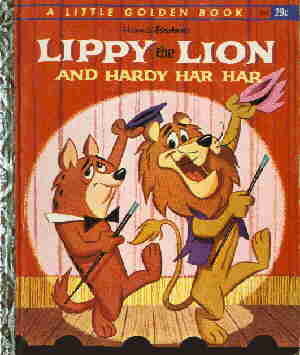 Lippy was, as the name implies, a lion; and Hardy was a rather dour-faced, non-laughing hyena. Their schtick was that Lippy (like Tennessee Tuxedo or Uncle Waldo on Hoppity Hooper) would come up with a wonderful but unworkable scheme to achieve whatever goal he was after; but it was usually Hardy, the pessimistic one, who suffered worse from whatever consequences befell them as a result. They operated in an urban setting, despite the fact that the opening sequence of their segment, which involved swinging on vines and escaping from crocodiles, implied something radically different. Lippy's voice was provided by Daws Butler (Peter Potamus, Huckleberry Hound and a vast horde of others). Hardy's was first done by Mel Blanc (Speedy Gonzales, Marvin Martian and an even vaster horde), but later on, Butler took over that role as well. Lippy and Hardy were merchandised just like all the other Hanna-Barbera characters, but never to any great extent. They starred in one comic book, which Gold Key published with a March, 1963 cover date, and appeared in the back pages of a few others. They were also in one Little Golden Book, which came out about the same time. The New Hanna-Barbera Cartoon Series ran two seasons, a total of 51 episodes. It remained in syndication for a time after production ended, but eventually disappeared from the airwaves. Lippy and Hardy have since dropped almost completely out of sight. Text ©2003-06 Donald D. Markstein. Art © Hanna-Barbera.